The only reason I ever remember my wedding anniversary is because my Grandma sends Chris and me a card in the mail every year. (Thank you, Grandma!) And whenever someone asks me how long I’ve been married, I freak out a little bit and have to do some quick math in my head. Did we get married in 2005? Or was it 2006? (It was 2006.) What year is it now? What’s 13 minus 6? OH NO WHAT’S 13 MINUS 6??? I really should just throw out a random number because how would they know, right? Also, I really should buy some flashcards and practice basic math. So today is our anniversary! We used to use it as an excuse to get an expensive dinner, but now we don’t really do anything for it. And that’s okay! With both of us! I’m lucky to have married someone who is as into anniversaries and birthdays and holidays as I am. Which is to say, not at all. Anniversaries just seem kind of arbitrary to me. Like, hey, the Earth has rotated around the sun 7 times since we got married–here’s a box of chocolates! I’m not really into grand gestures, you see. I’m more about the small, everyday things. Although he tries every recipe I make for Oh My Veggies, every once in a while I will make something that I deem a Chris recipe–something I make with him in mind because I know he’ll love it. 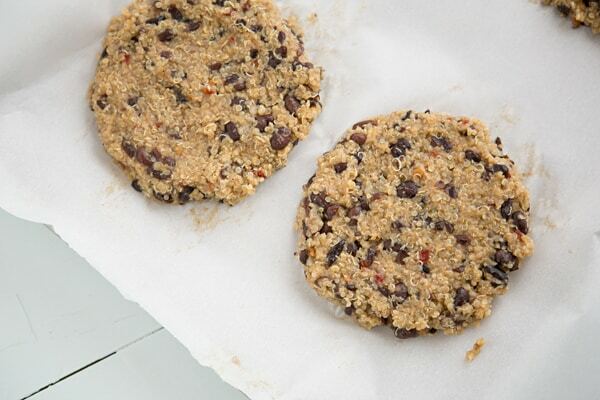 These Chipotle Black Bean Quinoa Burgers are definitely a Chris recipe, thanks to a healthy dose of chipotle pepper. I like chipotle, but Chris loves it. 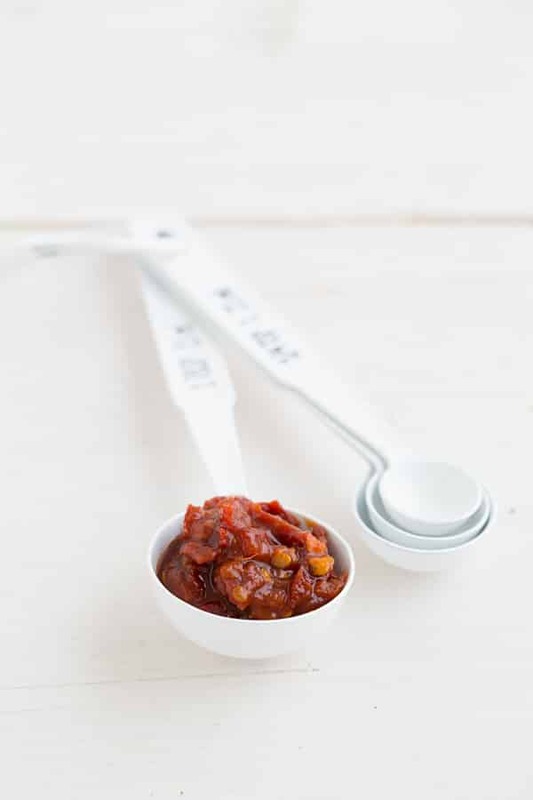 The annoying thing about cooking with chipotle peppers is that you always have leftovers–I like to puree the remaining peppers and sauce, freeze them in an ice cube tray, and use them later. I describe the whole process in my Crispy Chipotle Potato Tian post. The first time I tried making these, I wanted to put corn in the burgers, but they ended up crumbling, so I decided to do a sweet corn relish instead. (It’s summer! I had to figure out some way to include corn!) The relish can be made up to two days in advance. If you want it to have a little more heat, you can substitute a hotter pepper for the jalapeño. Other good toppings for these burgers include pepperjack cheese, mayo (cashew or otherwise), salsa, grilled or caramelized onions, fresh tomatoes, and cilantro. I hate telling people what to put on their veggie burgers because really, anything goes. Oh, and this is the third burger recipe in my summer of veggie burgers series! I posted Cauliflower Hummus Burgers with Mint Tzatziki in May and Lentil Mushroom Burgers in June. Don’t feel like making your own burgers? That’s okay too! Here are my favorite store-bought veggie burgers. Veggie burgers made with black beans, quinoa, and minced chipotle peppers, topped with homemade Sweet Corn Relish. Mash half of the black beans in a large bowl. Stir in remaining black beans, quinoa, panko, garlic, minced chipotle, onion powder, and cumin. Once all ingredients are fully incorporated, add salt to taste. Fold in the beaten egg. Line a baking sheet with parchment paper. Divide the burger mixture into 6 mounds on the baking sheet, then shape each mound into a bun-sized patty. Bake the burgers for about 20 minutes, carefully flipping halfway through baking time. They’re done when they’re baked through and slightly crispy on the edges. 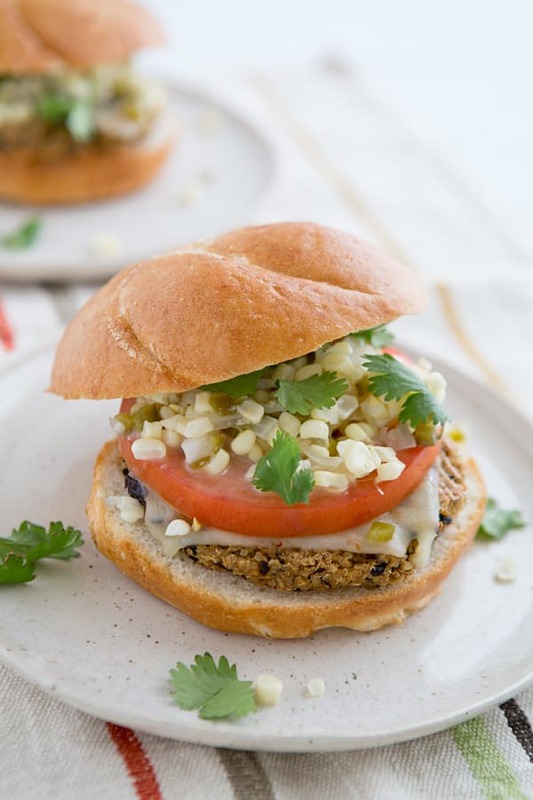 Serve with Sweet Corn relish and your favorite veggie burger toppings. Combine all ingredients in a small saucepan and bring to a boil. Cover and simmer for 10 minutes, stirring occasionally. Refrigerate up to 2 days before serving. I tested this recipe several times and I preferred 1/2 tablespoon of chipotle, while Chris preferred a full tablespoon. If you’re not sure, I’d start with 1/2 tablespoon, taste the burger mixture (before you put the egg in! ), and add more from there. I think it’s so sweet that grandma sends a card! And these burgers! I just recently fell in love with black bean burgers so these are just screaming my name. I NEED these for lunch, please! Happy anniversary! I am the opposite way, I like to celebrate anything! And these burgers look so good and the relish sounds delicious, I’ll have to try it. Happy anniversary! These look absolutely delicious. I like things like anniversaries and birthdays just for the fact that they can be an excuse to eat delicious food I normally wouldn’t bother with. Happy anniversary! I just posted about a veggie burger I made with my boyfriend in mind, but with buffalo instead of chipotle; mine was more of a sneaky way to get him to look forward to veggie burgers though, whereas it sounds like Chris loves everything you make – that’s awesome! These look nice and hearty and I love the sweet corn relish. I saw that post in my inbox–I can’t wait to read it because I know we’d love those burgers too! Is there a substitute for the egg? You could try substituting a flax egg, but I haven’t tried it myself so I’m not sure how it would work out. I used a flax egg in mine and they were delicious. They held together also. I always refrigerate my flax egg for at least an hour. This veggie burger looks really yummy…your photos always make me hungry! My guy has yet to try a veggie burger. And I have yet to make one – well, at least, make one successfully. I think I need to remedy both of those things – I’m pretty sure he would especially love these, too. Really?! He won’t even try one? Oh no, you need to remedy that for sure! But yeah, I’m with you on the veggie burger reluctance. I posted my first veggie burger recipe in May! And that was only because I was tired of people asking–ha. They really are tough to tackle. You know that we share a similar sentiment towards holidays. Except where our kids are involved because it’s so fun and magical for them. But regardless, happy anniversary! I hope you guys enjoyed your day together! Your quinoa based burgers look amazing, they should add them to a restaurant menu :d.
I am going to try to cook them tonight, the recipe sounds easy to understand and they look delicious. Going gluten-free recenly, i had to make a lot of adjustment and Quinoa has proved to be an exceptional ingredient, very nutritive, so i am collecting a list of recipes to add to my arsenal. This does have panko in it, but you can substitute gluten-free breadcrumbs. 🙂 Good luck with your new GF diet! I bought a jar of sweet corn relish recently thinking it would make a good condiment, but it was so sweet and gummy that I had to throw it out…your fresh version sounds much better, especially as a topping for a spicy veggie burger! I think sometimes the jarred ones have WAY too much sugar. I tried this recipe tonight and just wanted to say that my husband and I loved them. Thanks so much! We will definitely be having them again! Also- I topped this with roasted tomatillo salsa – excellent! These were SO good! This is only the second veg burger I’ve ever made, this was my fave. I really loved the crunch and the spice. I swapped the beans for garbanzo and the chipotle for fresh jalapeno to suit my preferences. I’m a newbie to healthy cooking, so I’ve only made quinoa twice now. This time the fancy brand I bought said to toast the seeds in a little olive oil before cooking, so I did. WOW. The flavors that it coaxed were insane. I will never make quinoa without toasting them first again. So yummy. Next up, Baked Root Vegetable Chips with Buttermilk-Parsley Dipping Sauce to go with my leftover burgers. I have loved everything I’ve made from your site so far. Oh My Veggies rocks! I love these burgers. Thank you!! Yes, these do freeze well!